Infrared is usually divided into 3 spectral regions: near, mid and far-infrared. The boundaries between the near, mid and far-infrared regions are not agreed upon and can vary. The main factor that determines which wavelengths are included in each of these three infrared regions is the type of detector technology used for gathering infrared light. Near-infrared observations have been made from ground based observatories since the 1960's. They are done in much the same way as visible light observations for wavelengths less than 1 micron, but require special infrared detectors beyond 1 micron. Mid and far-infrared observations can only be made by observatories which can get above our atmosphere. These observations require the use of special cooled detectors containing crystals like germanium whose electrical resistance is very sensitive to heat. Infrared radiation is emitted by any object that has a temperature (ie radiates heat). So, basically all celestial objects emit some infrared. The wavelength at which an object radiates most intensely depends on its temperature. In general, as the temperature of an object cools, it shows up more prominently at farther infrared wavelengths. This means that some infrared wavelengths are better suited for studying certain objects than others. Visible (courtesy of Howard McCallon), near-infrared (2MASS), and mid-infrared (ISO) view of the Horsehead Nebula. Image assembled by Robert Hurt. As we move from the near-infrared into mid and far-infrared regions of the spectrum, some celestial objects will appear while others will disappear from view. For example, in the above image you can see how more stars (generally cooler stars) appear as we go from the visible light image to the near-infrared image. In the near-infrared, the dust also becomes transparent, allowing us to see regions hidden by dust in the visible image. As we go to the mid-infrared image, the cooler dust itself glows. The table below highlights what we see in the different infrared spectral regions. As we move away from visible light towards longer wavelengths of light, we enter the infrared region. As we enter the near-infrared region, the hot blue stars seen clearly in visible light fade out and cooler stars come into view. Large red giant stars and low mass red dwarfs dominate in the near-infrared. The near-infrared is also the region where interstellar dust is the most transparent to infrared light. 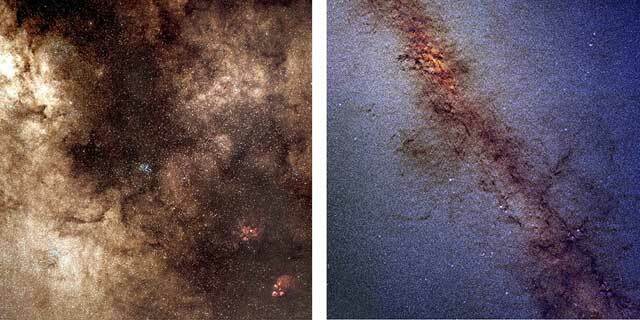 Notice in the above images how center of our galaxy, which is hidden by thick dust in visible light (left), becomes transparent in the near-infrared (right). Many of the hotter stars in the visible image have faded in the near-infrared image. The near-infrared image shows cooler, reddish stars which do not appear in the visible light view. These stars are primarily red dwarfs and red giants. Red giants are large reddish or orange stars which are running out of their nuclear fuel. They can swell up to 100 times their original size and have temperatures which range from 2000 to 3500 K. Red giants radiate most intensely in the near-infrared region. Red dwarfs are the most common of all stars. They are much smaller than our Sun and are the coolest of the stars having a temperature of about 3000 K which means that these stars radiate most strongly in the near-infrared. Many of these stars are too faint in visible light to even be detected by optical telescopes, and have been discovered for the first time in the near-infrared. As we enter the mid-infrared region of the spectrum, the cool stars begin to fade out and cooler objects such as planets, comets and asteroids come into view. Planets absorb light from the sun and heat up. They then re-radiate this heat as infrared light. This is different from the visible light that we see from the planets which is reflected sunlight. The planets in our solar system have temperatures ranging from about 53 to 573 degrees Kelvin. Objects in this temperature range emit most of their light in the mid-infrared. For example, the Earth itself radiates most strongly at about 10 microns. Asteroids also emit most of their light in the mid-infrared making this wavelength band the most efficient for locating dark asteroids. Infrared data can help to determine the surface composition, and diameter of asteroids. IRAS mid-infrared view of Comet IRAS-Araki-Alcock Dust warmed by starlight is also very prominent in the mid-infrared. An example is the zodiacal dust which lies in the plane of our solar system. This dust is made up of silicates (like the rocks on Earth) and range in size from a tenth of a micron up to the size of large rocks. Silicates emit most of their radiation at about 10 microns. Mapping the distribution of this dust can provide clues about the formation of our own solar system. The dust from comets also has strong emission in the mid-infrared. Warm interstellar dust also starts to shine as we enter the mid-infrared region. The dust around stars which have ejected material shines most brightly in the mid-infrared. Sometimes this dust is so thick that the star hardly shines through at all and can only be detected in the infrared. Protoplanetary disks, the disks of material which surround newly forming stars, also shines brightly in the mid-infrared. These disks are where new planets are possibly being formed. In the far-infrared, the stars have all vanished. Instead we now see very cold matter (140 Kelvin or less). Huge, cold clouds of gas and dust in our own galaxy, as well as in nearby galaxies, glow in far-infrared light. In some of these clouds, new stars are just beginning to form. Far-infrared observations can detect these protostars long before they "turn on" visibly by sensing the heat they radiate as they contract." the COBE/DIRBE Science Team, and NASA The center of our galaxy also shines brightly in the far-infrared because of the thick concentration of stars embedded in dense clouds of dust. These stars heat up the dust and cause it to glow brightly in the infrared. The image (at left) of our galaxy taken by the COBE satellite, is a composite of far-infrared wavelengths of 60, 100, and 240 microns. Except for the plane of our own Galaxy, the brightest far-infrared object in the sky is central region of a galaxy called M82. The nucleus of M82 radiates as much energy in the far-infrared as all of the stars in our Galaxy combined. This far-infrared energy comes from dust heated by a source that is hidden from view. The central regions of most galaxies shine very brightly in the far-infrared. Several galaxies have active nuclei hidden in dense regions of dust. Others, called starburst galaxies, have an extremely high number of newly forming stars heating interstellar dust clouds. These galaxies, far outshine all others galaxies in the far-infrared. IRAS infrared view of the Andromeda Galaxy (M31) - notice the bright central region.